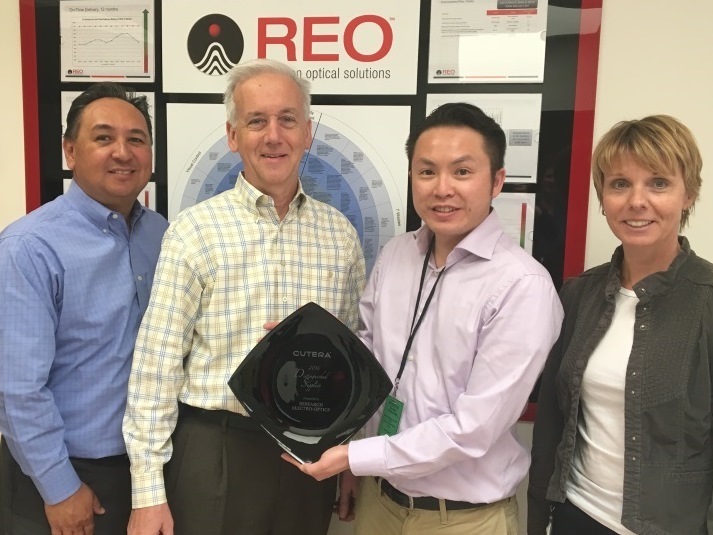 REO Receives Distinguished Supplier AwardREO Inc.
Boulder, CO – REO, a volume manufacturer of high precision assemblies, optical components, thin film coatings and HeNe lasers was recently recognized with a Distinguished Supplier Award from their customer Cutera. The customer indicated that the main criteria of meeting the Distinguished Supplier status is the way that REO responded to the challenge of rapidly increasing volume. This award acknowledges that in response to these challenges, REO has gone through the necessary process of identifying the obstacles, finding an immediate solution, and putting processes in place to enhance their ability to respond to increases in demand. Sales Manager, Bob Valdez, testifies that “One key to this success is our responsiveness to work closely with the customer on optics that have proven to be very technically challenging. We proactively stepped up to support Cutera with potential solutions and worked quickly together to get processes in place to support their needs.” Open communication between the REO manufacturing and engineering teams and Cutera allowed REO to quickly address concerns and find a solution that best supported the customer’s technical and scheduling demands. Cutera is a leader in medical aesthetic lasers, manufacturing devices focused on delivering the highest level of performance, safety and efficacy. REO has proven to be a partner that provides high performance optics that enable their customers to be competitive in the demanding markets of medical and aesthetic lasers.